Feel free tell Rush exactly what you think. Venting is good for the soul. Super Tuesday | Let the Games Begin! Just confirms it for all. He’s lost 33. He’ll be forgiven eventually and go right on back to what he does best. It would really surprise me if he lost his show. I mean, his ranting is what draws the advertisers anyway. Agreed. I’ve wondered if completely ignoring him would have been more affective since he’s an attention seeker. But then, the sponsors wouldn’t have pulled then. 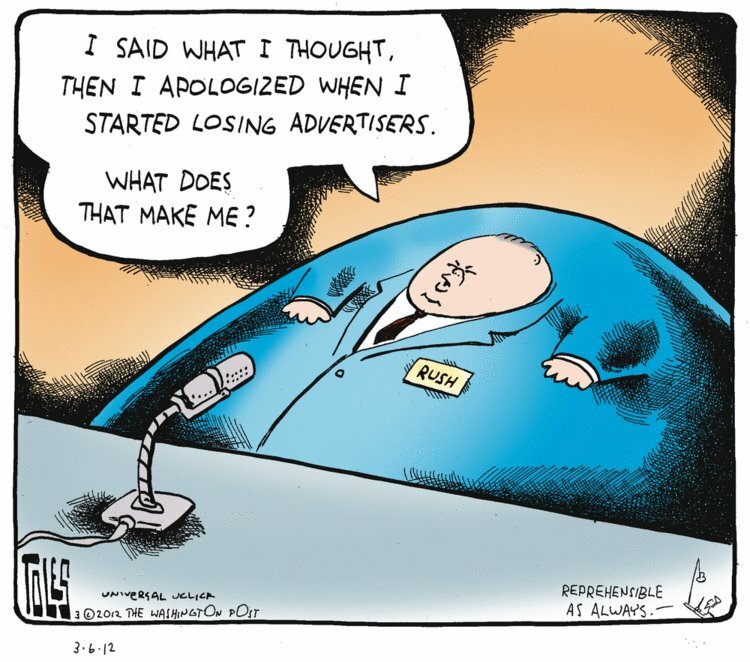 I’m loving the fact he’s losing so many sponsors… and some big ones, too. I like that he’s losing too. I also wonder if this was the final blow for him. Would be nice if it is. I’d love to see him lose his show like Imus did. I think his offense is far worse than Imus’s was. But too many Republicans love him. I doubt he’ll lose anything but some advertisers. Hard to say. Hopefully they (whoever “they” is) decide that he went too far this time. 29 gone – and counting. It makes you a sorry excuse for a man, who is really only sorry for losing some $$$ponsors! Hi, thanks for liking my Niger national park blog post.